The first and only FULLY CUSTOMISABLE Magic The Gathering PREMIUM scoreboard app. The most polished app of its type on any platform, average rating of 4.6/5.0 worldwide - visit us at MTG4LifeApp.com ! A tongue in cheek “Thug Life” version of the popular MTG “life counter” app - "MTG4Life"! 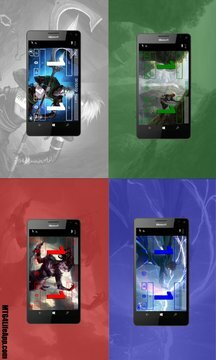 Show your true gang colours - reskin entire app to any magic colour. Fully blinged with dozens of 2D/3D animations, screen transitions and "Pimp Your Ride" attention to fit and finish. See the animated blood fly as your opponent takes damage! Dope design with awesome ergonomics - extra large life display and buttons for two player dual-use with a separate dedicated page for score history. Includes custom designed vector graphics buttons that animate and reskin to any magic colour. Pace yourself with a super accurate visible timer plus game alarms for round timeout and 10 minute warning. Fully settable, continues working when receiving phone calls, lockscreening or switching between apps. Make your opponents history - literally - with history recording and a dedicated display that flips into view in 3D. Keep your hits accurate - built in "SmartScore" watches you tap inputs and gives animated feedback of total life change before recording it in the score history. Just tap large buttons the same number of times as points of damage, the app does the rest, mental arithmetic not required! Gone but not forgotten - if the phone sleeps or you close app by mistake all scores for current game are safely stored, together with customisations. Never forget a face- enter it in name tags at start of match! Finished designing your app? 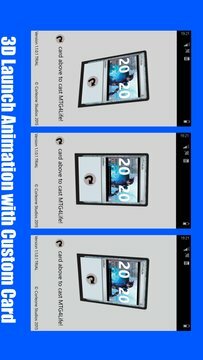 Enjoy it come to life as your very own custom magic card, in 3D launch and finishing animations. Extra Thug Life bonus - enjoy built in "Magic" comedy raps! Visit our website at mtg4lifeapp.com for a video overview, latest custom jobs and free wallpaper downloads. MTG4Life is designed as a large SHARED dual-use gaming scoreboard placed BETWEEN the players overlooking the game, much like a tennis scoreboard. It can be used by both players, each being able to update their scores with their own large controls - see "Shared Scoreboard" picture below. You can contact us directly via our support email "mtg4life@outlook.com". Please use this first rather than leave a bad review/comment on our store page. We respond to every email and will do our best to solve your issue.